It's Tuesday...'nuff said. Time for random thoughts. I spent the early part of this maintenance day researching some stuff I needed to know. Not the raid stuff sorts of things, (Sol still isn't there yet), but the sort of things I needed to know for the profession leveling Khrox and Kaimara are pushing. Prime example; Infinite Dust. Kai needs like 600 of these, where do they all come from? With Khroxs' leatherworking/skinning skills and Kai's enchanting/tailoring, the two can work together, at least to some extent, providing each other with mats, enchants or whatever. And we won't even get into the vast amounts of Borean Leather Khrox needs atm. Both have recently started some dungeons with the encouragement of the guild leader. Sol had joined DUT a few months back, now both Khrox and Kai have become members. This is a good thing. Even though they are now 75 and 70 respectively, this is still a much earlier start than Sol had. Guild membership has been great for all three, and being able to experience this part of the game now is exciting. It's great being in a guild that is friendly and helpful to it's members. Without this atmosphere, I doubt if I would even have a chance at raiding. I have to admit though, both hunter and mage seem to be doing better than Sol. UI- last I spoke of my UI, I had just installed Grid. This did not go well for me. Just couldn't get to show what I wanted to show and configuring it just didn't click as well. Gave up on it and installed Pitbull4 instead. "Happy Camper" time! Out of the box, I only needed a few placement changes to be up and running. Configuration is much easier for me, and I like the looks of everything soooo much more than Grid. Now, I'm not really putting Grid down. It's a great add-on which I know a lot of tanks and healers use. For me and all my dps alts though, Pitbull4 just turned out to work better. And about that "raid" thing? Well, I guess we all have some sort of dream for this or that. With Sol, the dream recently grew to this: Dragonwrath, Tarecgosa's Rest-Legendary Staff. LOL, it's okay to dream. Right? Okay, so maybe there's limits to such lofty dreams. In the meantime, Khrox has a little play time while waiting for a rare spawn. 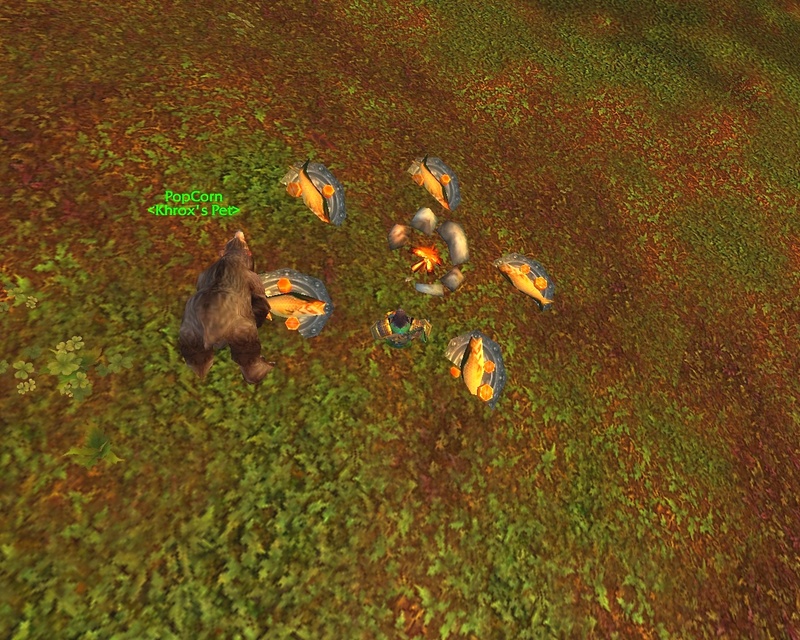 What better to do than help run up the feast count for a guild achievement?